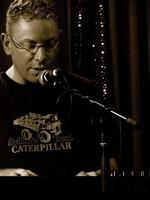 Andrew Batterham is a Melbourne-based composer, arranger, songwriter and performer. He is active across many fields including contemporary concert hall music, jazz, corporate music, big bands, Latin bands, TV, educational music and community ensembles. His music has been performed, recorded and broadcast in Australia, Asia, Europe and the USA, by artists ranging from jazz legend James Morrison to the Melbourne Symphony Orchestra. After studying composition with Brenton Broadstock, Batterham worked as a trumpet player and pianist in the commercial scene for many years. Tutelage from Graham Hair and Mark Pollard followed. Upon winning the Qantas Youth Award of the Paul Lowin Prize, he travelled to New York to study with Broadway arranger and musician Ian Finkel, and to London for lessons with John McCabe. In 2000 he was commissioned by Symphony Australia to write a work for the Melbourne Symphony Orchestra, and The End of All Journeys was subsequently nominated for an AMC award. He has also won the inaugural Corbould Composition Prize, been commended for the Albert H. Maggs Award, participated in the Australian Composer's Orchestral Forum, and won awards for his songs from the National Songwriting Contest. Andrew Batterham is very active in the band world, composing Highwayman for the New Zealand National Brass Band championships in 2001, and A Golden Summer's Day for the Australian Championships in 2002, as well as supplying a test piece for the 2002 Tasmanian Championships. His band music has been performed and recorded by high-profile performers such as James Morrison, and his music is included in several examination syllabuses. He is currently Program Leader for Academic Support at the Australian Institute of Music, Melbourne campus. Commercially Batterham's corporate music has been heard on videos, TV and radio in commercials, short film scores and corporate events. He has also arranged orchestral backing music for several albums by various artists. Batterham's rock songs have received certificates of commendation in the Australian Songwriters' Association National Songwriting Contest, and received further exposure as the soundtrack to ATV10's Extreme Sports program. Recent professional activity includes an Australia Council grant for piano sonata Spring Music for Natasha Lin, The Pioneer (based on Heidelberg School paintings) for guitarist Ken Murray, Eden at the 2016 Melbourne Fringe Festival, and attendance at the 2015 premiere of Concertino for solo tuba and wind band at the São João Festival in Portugal, by Sérgio Carolino and the Banda Sinfónica Portuguesa. Batterham has also attended the International Tuba and Euphonium Conference in Knoxville, Tennessee, where Capriccio was given its USA premiere and Concertino won the Harvey Phillips Composition Award. Residencies have included the Sydney International Brass Festival, and the Gravissimo brass festival in Portugal. Recently released music includes Organica on a disc by Ensemble Three (Tall Poppies), Duke's Crusade for saxophonist Michael Duke (Cala Records UK), and Capriccio for euphonist Matt Van Emmerik (Independent). Batterham's music is published by Potenza Editions (USA), AVA Editions (Portugal), Reed Music, Lyrebird Press, and Wirripang. Euphonia (solo euphonium) (2016) Commissioned by Matthew van Emmerik. Spring music : Piano sonata no. 2 (2014) Commissioned by Natasha Lin. Organica : for trumpet, trombone and acoustic guitar (2013) Commissioned by Three (Musical group). The Four Immortals : for four low brass soloists, low brass and percussion (2013) Commissioned by Sydney International Brass Festival, Steve Rosse.